13 Reviews for Cisco CCNA IPv4 Tutorial: Everything You Need! Excellent, Very nicely explained. Excellent work Laz and thank you very much for posting this video. This is the best CCNA instructor I have come across. I have been around a number of them and Laz is the best. I really enjoyed this IP addressing course. Laz breaks down all of the information in a very simple way. I watched his Youtube video which was very good and decided to buy this course. I'm very happy that I did. There are no overly complicated formulas and his way of explaining is like listening to one of your friends talk. No instructor talking over your head stuff. He instructs like a regular guy who just happens to be an expert with IPV4. Very instructive, easy to understand, teaches real-world concepts in an engaging way. Subnetting is quite easy now. I came in a "noob" and now am leaving "adept." This course helped me understand the concept of subnetting, something I had no absolute understanding of. This course helped me to master the art of subnetting and ip addressing!! After struggling with subnetting again and again using countless methods/tricks/etc I finally "saw the light" after taking this course! I can't do it all in my head, yet, but now feel real confident when tackling the calculations and spend less than half the time that I did with any other method I've tried! Excellent course all the way around!!! I've just taken the 1st two Cisco flex courses in college. These classes went so fast that I was not able to retain too much of what I was learning. But with this online course, it gives me an opportunity to reinforce what I have learned in the college course. 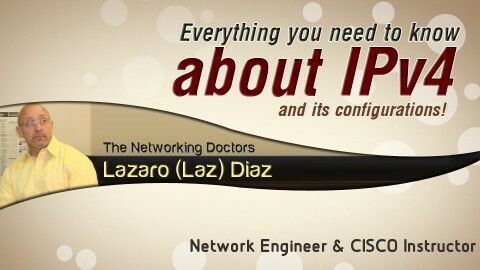 Instructor Laz Diaz does a great job in helping me to fully understand networking in a simplified and easy way. This is a great course if you want to really dig into understanding IPv4. I recommend it! Its a excellent course to pick up nuances of IPV4 addressing. Kudos to Lazaro for making it easy to learn!! Great course, great instructor! The packet tracer is an awesome tool to simulate networks. A LOT of info in this course. You can tell Laz is excited about technology. He emphasizes the important topics & keeps your attention even when the subject matter isn't the most exciting. I consider this course $$ WELL spent. Thank You Laz!